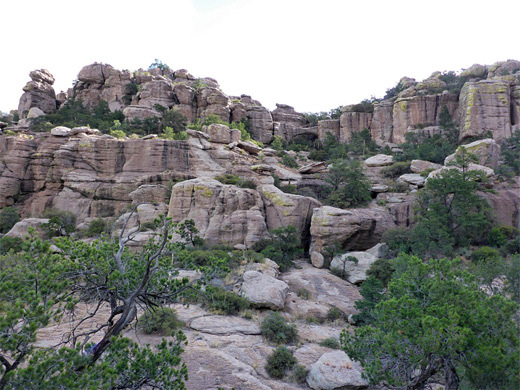 The Natural Bridge is an angular arch in the dark grey rhyolite rocks that cover most of Chiricahua National Monument, and may be viewed at the end a 2.4 mile trail, the only major hiking route in the northern section of the park, north of the scenic drive. The bridge is only 0.3 miles from the road, but guarded by impassable cliffs to the south, so the path has to take a circuitous course, up one ravine (North Bonita Canyon), over a grassy plateau and down into another valley, Picket Canyon, containing a secluded group of pine trees (Picket Park), and lined by many photogenic formations. The trail ends at an elevated viewpoint, 400 feet from the bridge, which although large, is situated immediately in front of a cliff and so is not so distinctive from afar, especially in the morning when it lies in shadow. 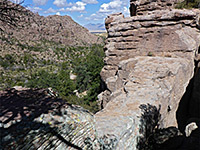 There is no trail directly to the natural bridge owing to steep terrain below, but the base may be reached relatively easily, by scrambling up slopes and benches. 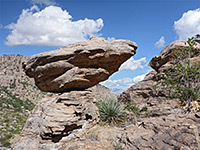 A rather longer diversion is required to stand on top, and explore the other shapely rocks nearby, on the valley rim, and from here, a partial loop can be made by walking north, through the rocks and across the plateau beyond, rejoining the official trail just before the descent into North Bonita Canyon. 23 views along the trail, and of the bridge. 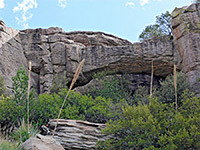 The Natural Bridge Trail is provided with a small pull-out accommodating about five vehicles, in a narrow, steep-walled part of Bonita Canyon; 1.4 miles beyond the visitor center, on the north side of the road. 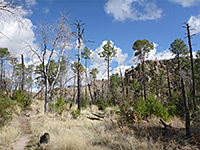 The path immediately crosses the usually dry creek bed, ascends slightly through a thin band of trees and big boulders, then emerges to open, sunny flats, at the wide lower end of North Bonita Canyon. This ravine is followed upstream for a while, until the trail climbs more steeply, curving west around a small dividing ridge and into a little north fork, before rising to the western rim - at the edge of the plateau which divides the drainage from the adjacent valley containing the natural bridge. 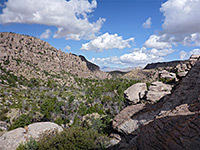 The plateau gives fine views westwards, over peaks and slopes in the foreground, and beyond to the flat plains at the edge of Sulphur Springs Valley, 1,000 feet below. The path winds through long grass and boulders then descends into a sheltered basin, containing many trees, initially burnt, relic of a 2011 wildfire, but later undamaged. This is Picket Park, which at some times of the year contains a small creek, flowing through grass-lined pools. The trail follows the upper end of this stream, as the trees grow taller and closer, before crossing the creekbed and rising to the final viewpoint on a treeless ledge, marked with an End of Trail notice. The bridge, 150 feet higher, is due east, on the opposite side of the streambed. The easiest route to the bridge is back down the trail to the creekbed, upstream a little way then up the valley sides to the base of the lower band of the cliffs, traversing southwards until these relent, ascending a rocky spur and heading back north along a bench. Directly below the bridge is a deep cavity with boulders and a sloping pour-off, not easily climbable, while just to the north is one of several narrow, vertical-walled crevices that cut through the rocks in this location. The ridge incorporating the top of the arch may be reached by walking back south along the base of the upper layer of cliffs until these too stop, up a slope to the top level of the rocks, and finally back north. All around are spires, cliffs, crevices and much spectacular scenery, made more colorful by the green or orange lichen that covers many of the rock faces. On the far side of this ridge, the land slopes steeply down to a short, rocky ravine that leads to the road, not easy to explore owing to vertical drops and thick vegetation, but upstream (north) this soon becomes shallow, and more straightforward to cross. 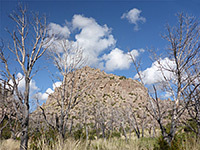 Beyond, the rocks quickly fade away, replaced by the flat, grassy plateau, which is crossed by the trail a third of a mile further.